A community has come together to support the victims of a huge explosion that ripped apart a bungalow and injured two people. The suspected gas blast happened in Barn Park, Buckfastleigh, Devon, at about 07:50 GMT on Saturday. Marilyn Rice, 65, was airlifted to hospital in Bristol with "serious" burns while another person was treated for minor injuries at the scene. She said she was lucky to escape the devastation that destroyed three homes. "That young person who got Marilyn out in time, I'll never thank him enough," she said. Buckfastleigh Town Council said at least three local residents "will have lost almost everything" in the blast. It launched a fundraising effort to help those affected. "Our community response has been amazing, and everything that you would expect from such a close-knit and caring town," it said. 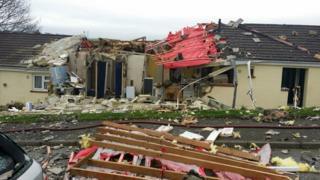 Neighbours Victor and Pauline Manfield said the blast sounded "like a plane coming down". Several residents had to leave their homes after the explosion, which damaged buildings and cars nearby. Assessors from Teign Housing are on site to see how safe the properties are. They will make a decision on Monday on rehousing those affected.